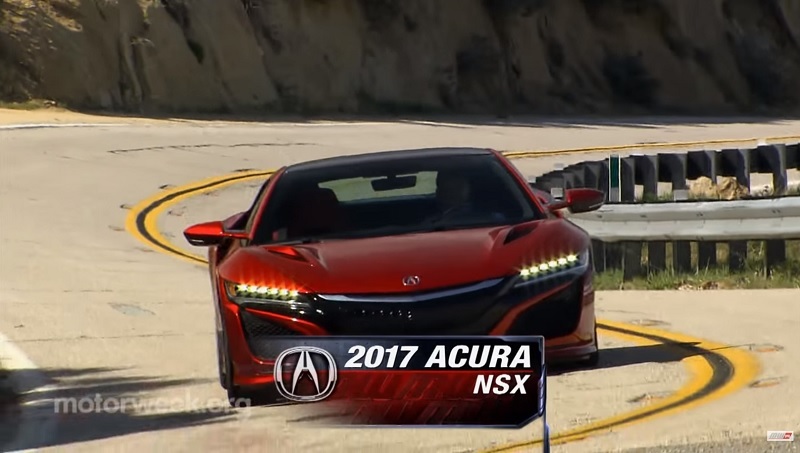 We’ve heard early reviewers complain about the new 2017 Acura NSX and how it doesn’t do the original justice, well MotorWeek would beg to differ. Like the original NSX, the new cockpit still retains that low riding position with cozy seats and great all-around visibility. Moving the rear of this car is a 3.5L twin turbo V6 engine with 2 electric motors powering the front wheels for an overall output of 573 horsepower and 476 lb-ft. of torque. The V6 is mated to an additional e-motor for a bit of electrical assistance at launch, something to get you moving during the turbo lag until the twin turbo gets up to speed. Paired with Honda’s own 9-speed DCT transmission, the NSX will give drivers a smooth shifting experience but it will occasionally hang on to a gear longer than you’d like. That’s okay, because the NSX still performs like an Italian exotic on track. They did mention that one of the causes for the negative early reviews may be the 3 different sets of tires that are available with the NSX. There are the standard street driving Continentals and two track options, the Pirellis and Michelins. On track, the Pirellis gripped like a dream and help propel the car from 0-60 in less than 3 seconds. Its launch control would propel you like any other supercar with a larger price tag. Yes the NSX is by no means cheap at $157,800 (minimum) a pop but you could be paying more for similar performance in a different car. Overall, MotorWeek thinks Acura stayed true to the NSX heritage and it was worth the wait. Nice to get a positive review of the NSX and he's not biased either. One thing he points out that I don't think anyone else has is the occasional shift hang. Would like to see someone go into more detail about that. Is it really that noticeable? Fixing that transmission issue could be as simple as Acura making changes to its ECU but these have yet to get into the hands of consumers, so for all we know come time to take delivery this issue could be addressed by then. He does point out the price but it's an absolute bargain when you take into account the bevy of technology added to the vehicle, things that you'll have to pay way more for outside of Honda like the mclaren P1, laferrari or the 918. Indeed. We're getting the best of all worlds all right in the NSX, tech, pricing, etc. It's much like how Acura is elsewhere with other segments, even right down to the Acura ILX, if you want to look at it like that. The other upside to all of this is the fact we get it from one of the most reliable brands out there, only thing to worry about is price when things do break, but even then we have it good. Found a repair receipt for a 2004 NSX. Not too bad considering how old it is and how hard it probably is to find the OEM part. That is true and what might help the NSX is comparing the overall cost of maintenance to other vehicles in its segment since for all we know a big costly job like this could be the only one that stands out, compared to something else that goes well above what the NSX will cost someone. You'll get factory warranty for a few years and depending on how long you plan to keep the NSX, you can get additional warranty. I know aftermarket is cheaper but I assume they won't be prepared for the new NSX platform. May as well go OEM.